Israel may have missed out at the Oscars in Hollywood, but an Israel website, http://www.cityofdavid.org.il, won first prize at the UN-sponsored World Summit Awards (WSA) in Venice recently. Selected as “the best in e-content and creativity in the category of e-culture,” “this outstanding website brings remote visitors face to face with the protagonists and locations of the living Bible,” the WSA stated in its laudatory citation. View the website of the City of David. It is a beautiful site filled with small photos, videos, and timelines. 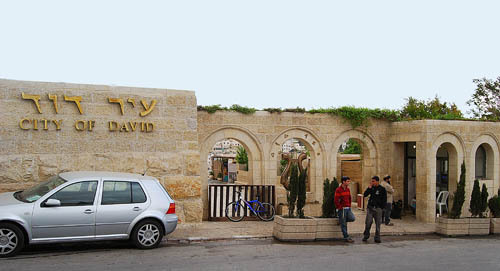 Below is a photo of the entrance to the City of David park. This entrance is located a little south of Dung Gate on the road that leads down to the point where the Kidron, Tyropean, and Hinnom valleys meet. This area is not without political controversy and ramifications. An alternative web site, From Shiloah to Silwan, has good material. This entry was posted in Archaeology, Israel and tagged City of David, Silwan. Bookmark the permalink. Why is cnn saying that this dig just opened in 2011? Very bad reporting right?